Join this tour in the ancient city of Split in which Desmo Adventure thoroughly explores Diocletian's Palace built in the fourth century. Dalmatia countryside offers picturesque villages and true untouched nature. Bosnia and Herzegovina holds undiscovered beauties just two hours away. Natural beauties and authentic food at Blidinje are out of this world. In order to learn more about Tito's Yugoslavia and war times, stop in Jablanica. Sarajevo is a few hours up north, an Olympic city and Bosnia and Herzegovina capital. Sarajevo is a mixture of different nationalities, religions, and cultures living all together in peace. On the way back, you visit Mostar, a city built on a river while the Old Bridge connects east and west Mostar. Close by is the town of Medjugorje which welcomes millions of Catholics each year. Dubrovnik is a must visit destination; worldwide famous city walls have a story to tell. During this tour, you will stay at three to four-star hotels or private accommodations. All the hotels and private houses are placed in the beautiful areas of each city which you visit. You will be provided with necessary parking for the bikes, breakfast, as well as other facilities. Every accommodation is located in the center of the town which you will visit or at a walking distance to the beach or downtown. Night one will be spent in Split. Get some good sleep at Blidinje nature park on night two. Have a well-earned rest in Sarajevo on night three. On the way back to Croatia, you spend the night four in Mostar, a city built on a river. Korčula will host you on night five. Make Dubrovnik your home on night six. The team will pick you up at Split Airport (SPU) or you will get together at the Desmo Adventure office for a short tour overview. You will enjoy a private tour of Split downtown and a dinner at a local restaurant. Your ride will take you to Makarska where you explore the town and soon after, you take a ride to Biokovo mountain, highest peak Sveti Jure at an altitude of 1,762 meters. On the other side of the mountain is town Imotski where you witness Red Lake and Blue Lake, true natural phenomena. In Imotski, you visit wineries and try their delicatessen. Next destination is Blidinje nature park placed in Bosnia and Herzegovina, right on the border with Croatia. In Blidinje at the altitude of 1,125 meters, you circle a lake, visit a wild forest, and have dinner at Hajdučke vrleti where the authentic food of Bosnia and Herzegovina is served. From Blidinje, you continue up toward Diva Grabovčeva, taking a small road toward Prozor where you take a short walk and experience the surrounding. Next stop is Jablanica where you learn more about Tito's Yugoslavia and war times in Bosnia and Herzegovina. You take a private tour of the war museum and visit a demolished bridge on river Neretva. The road takes you toward Sarajevo. Sarajevo is an Olympic city and third biggest city in ex Yugoslavia, also the capital of Bosnia and Herzegovina. In Sarajevo, you must taste famous food ćevapčići, Bosnian authentic food. You will have a chance to explore downtown and enjoy a night out in Sarajevo. Still in Sarajevo, you visit Sarajevo Tunnel and learn more about the Siege of Sarajevo. You get to know how and why Bosnians dug it, how long it took, and how roughly 3,000,000 people went through it. You take a beautiful scenic road to Medjugorje, a pilgrimage town Medjugorje where you can climb the hill where allegedly holy Mary appeared in 1981. A short ride from Medjugorje is a beautiful town of Mostar where you take a private walking tour and learn about east and west side of Mostar. There is the Old Bridge which connects the east and west coast. The same bridge was demolished in the civil war in November of 1993. You learn about Muslim culture from the east coast of the river and Catholic living on the west coast. Spend a relaxing evening in Mostar. On the way back from Mostar, you stop at the Hutovo Blato where you take a short kayak ride over the river channels. At lunchtime, you stop at a famous restaurant Kapetanova kuća in Mali Ston. Pelješac peninsula is a famous wine county where you go for a wine tasting tour and visit wineries along the way. In the evening hours, you take a ferry to Korčula. In Korčula, you visit Marco Polo birth home and enjoy local cafes in the old town of Korčula. Dubrovnik is a short ride from Korčula and a must-see destination in Croatia. Dubrovnik city walls construction started in the 8th century and finished in the 17th century and made Dubrovnik most preserved fortified city in the world. You take a tour of city walls and visit the filming location of Game of Thrones. Kayaking around city walls will be an afternoon activity from where you can observe city walls from the sea and enjoy swimming below the city walls. At night, you walk the main street Stradun and visit local restaurants and cafes. Winding roads take you back to your starting destination but using different route where you pass along coastal towns on the Dalmatian coast. Thereafter, you will be transferred to Split Airport (SPU). Born and raised in Split, the capital of the Dalmatia region, Duje believes he is the right person to deliver the highest value to you and take you to the most beautiful and exciting places in Croatia. As a true motorcycle enthusiast, he believes traveling to the Croatian coast on a bike is a great experience and allows you to explore the most of it. Excited about meeting new people and making new friendships, he believes it is one of the most valuable things in life. Spending time with people and showing them the beautiful country is his passion. He hopes to introduce the country to you. This tour will take place in Split, Makarska, Imotski, Blidinje nature park, Prozor, Jablanica, Sarajevo, Mostar, Medjugorje, Pelješac, Mali Ston, Ston, Korčula, and Dubrovnik. The tour will start and end in Split. The Croatian coast is 5,835-kilometer long, has 1,185 islands and islets, and extends from the northwest to the southeast. On your way to Bosnia and Herzegovina, you will visit many local places and towns on your way to major cities. During this tour, seven breakfasts and six dinners will be provided. Served food while touring will be authentic Mediterranean and Croatian cuisine. Dinners will be served at local and carefully chosen restaurants while breakfast will be served in cafes with coffee and pastries, omelets, or cereals. Please book your flight to arrive at Split Airport (SPU). Transfer from and to the airport is included. Desmo Adventure will pick you up from the airport. Airport: Split Airport Airport transfer included: Split Airport No additional charges. You can request this in the next step. 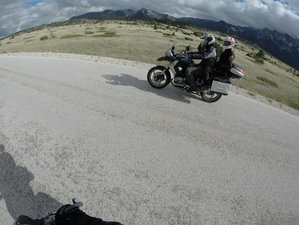 Desmo Adventure are two-wheel enthusiasts with travel experience in Croatia, Bosnia and Herzegovina, and Montenegro, delivering extraordinary experiences.